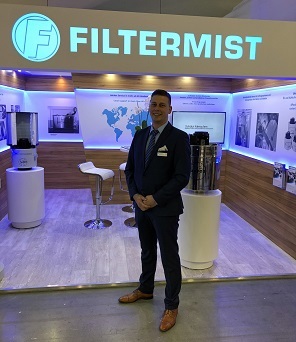 UK based oil mist collectors manufacturer Filtermist International has reported a record attendance at AMB 2018 under the leadership of newly appointed National Sales Manager for Germany, Dominique Ullmann. Dominique joined Filtermist at the beginning of July. He previously spent five years working at Sartorius Werkzeuge, one of Filtermist’s distributors in Germany, where his role was to strengthen sales of Filtermist oil mist collectors and other health and safety related products. AMB 2018 was the first time Dominique had taken part in a show in his new role and he was extremely pleased with the quality of enquiries his team received. “The Filtermist stand was busy throughout most of the week,” said Dominique. “We met with representatives from Filtermist distributors from nine other European countries, as well as many potential new customers. Oil mist is generated in a wide range of manufacturing operations including milling, turning, machining, grinding and EDM / Spark Erosion. If left in the atmosphere it can cause a number of health issues including respiratory diseases such as Extrinsic Allergic Alveolitis - it can also pose a slip and fire hazard, and can damage sensitive electrical equipment if ingression occurs. Filtermist has manufactured its compact oil mist filters since 1969 and is trusted by many of the world’s leading manufacturers to protect their people from exposure to airborne oil mist particles. The units can be directly mounted on the machine tool, or positioned on a floor stand or machine tool bracket. Ducting is inserted into the machine tool enclosure to capture contaminated air and draw it up into the Filtermist unit. Once inside, the oil mist particles are separated from the air using centrifugal force – the particles coalesce back into liquid for collection and clean air is exhausted back into the workshop. This process also helps to ensure that component quality remains consistent - extracting warm air from inside the enclosure helps to keep the temperature stable, which in turn helps to minimise the potential for thermal growth. Please contact Dominique on +49 (0) 170 2233931 if you would like to discuss Filtermist products in more detail. Alternatively, please visit www.filtermist.de to find out more.